Hello, a quick post to let you know that Imagination Crafts will be on stand A32 at the Hobbycrafts show at the NEC in Birmingham, from tomorrow, March 19, until the show ends on Sunday, March 22. Sue & Lisa will be demoing lots of different Imagination Crafts products & you're sure to be inspired. We hope to post photos from the show both here & on the Imagination Crafts Facebook page over the next four days, so be sure to check back. And if you're attending the show, we'd love to see your photos too. We hope you have had a good weekend. Today we have a tutorial for you from our Erin. 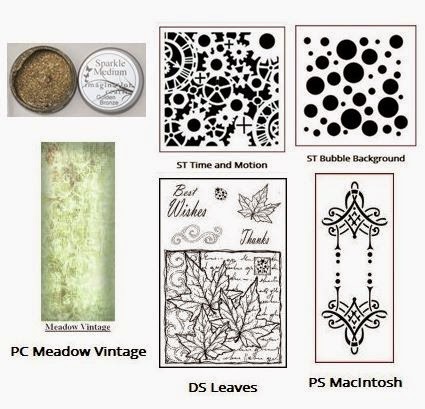 Start with the Imagination Crafts (IC) Panel Patterned Card in green which is coated. 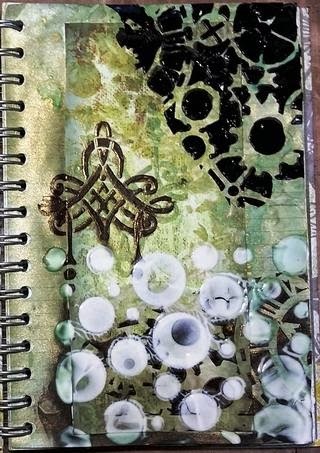 This was glued to an art journal page, and using 3 stencils from IC apply clear and black gesso and let dry. 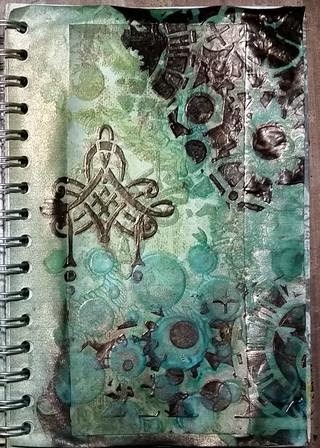 After the first layer of Gesso dried mist the entire page with Tattered Angels (TA) mist in Verdigris and let dry. 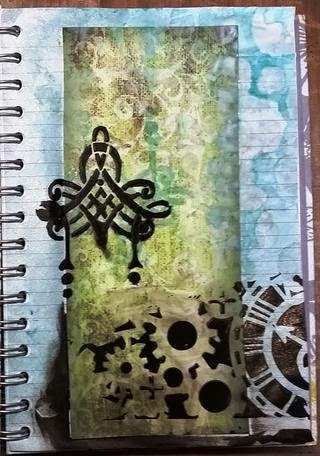 Add a second layer of black and clear Gesso with the same 3 IC stencils. 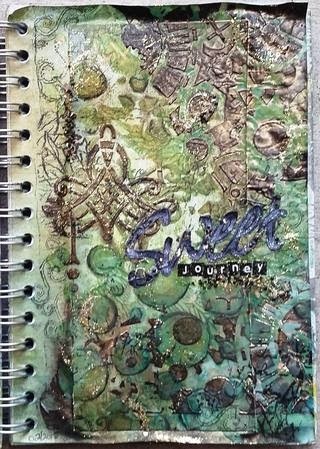 After drying again mist the entire page with TA Mist in Olive Vine. 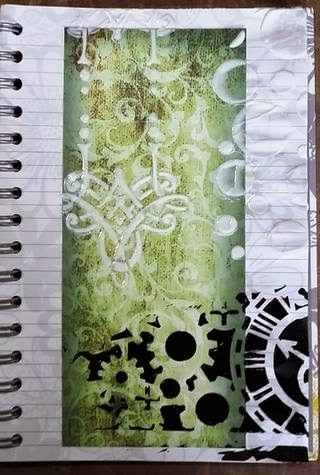 Add in more clear and black Gesso with the same IC stencils - layer 3. Do not use a heat gun to dry it bubbles the Gesso. After the Gesso dried add in another layer of TA mists in both Verdigris and Olive Vine. Look how the black Gesso pick up the shine in the mists and make it almost look gold!! Added gold Sparkle Medium and the title. Use a black pen to trace the circles at the bottom left to help them pop. 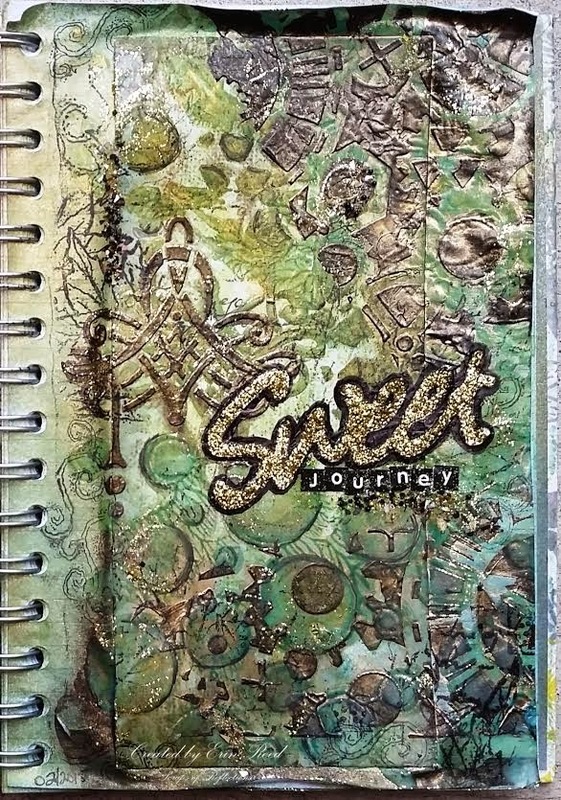 Also add black micro beads around the page and some IC stamps in black.